$5,000 = $18,000+ For Connect2Culture On Give Ozarks Day 2016! These funds will be used towards C2C’s annual operating budget to support its efforts as a community arts agency. These funds will aid in the development of an Arts, Entertainment, Education, and Historic District in Downtown Joplin. Within this district will be the new Joplin Arts & Entertainment Center located on 7th between Joplin and Wall Streets. This one-day, online fundraising event, hosted by the Community Foundation of the Ozarks raised more than $1 million dollars for local nonprofits. Last year, C2C raised$3,503.68 for operational costs. THANK YOU! Seeing these throughout town makes us smile from ear to ear! This is one of five registered “Little Free Libraries” in Joplin, MO. The concept? Take a book, return a book – free and open to all! 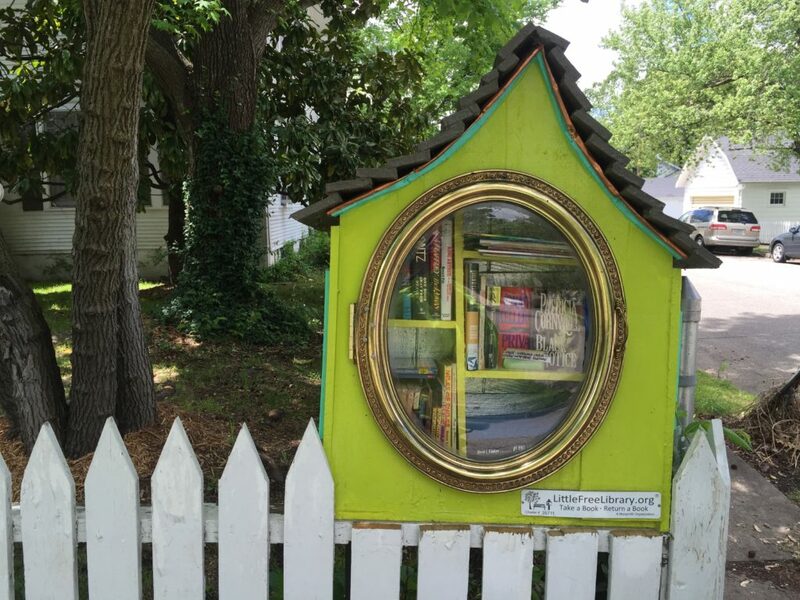 The mission of Little Free Library is “to promote literacy and the love of reading by building free book exchanges worldwide and to build a sense of community as we share skills, creativity and wisdom across generations.” Their goal is to build 2,510 Little Free Libraries – as many as Andrew Carnegie – and keep going. Anyone can join in the the fun! Visit LittleFreeLibrary.org to learn how you can get one for your neighborhood. Free film showing! See you there? Kansas Filmmakers Amber Hansen and Nicholas Ward are excited to share their recently released Documentary film “Called To Walls.” The film chronicles a series of community-based murals led by muralist Dave Loewenstein between 2010 and 2013. Featured in the film is the story and creation of Joplin, MO’s very own mural, “The Butterfly Effect: Dreams Take Flight (2011).” This film showing, presented by Connect2Culture, is generously sponsored by State Representative Charlie Davis and Sharon & Lance Beshore. Out of view of the high art world and the hip gallery scene comes this heartening story of unlikely partners in middle America working together to reexamine their histories, celebrate what makes their towns unique, and imagine their futures in the form of monumental community murals. The creation of “The Butterfly Effect: Dreams Take Flight (2011)” located at 15th and Main Streets is included in the film. This community mural project was created with the support of a dedicated design team made up of 20 community members and more than 300 community volunteers. An exhibit of three dimensional works and sketches by Matthew Dehaemers: Fusing – Grafting – Melding, along with a retrospective and update on selected individuals affected by the May 2011 tornado and featured during the original Dear World: From Joplin with Love exhibit, will open Saturday, May 14, at Spiva Center for the Arts. Both exhibits will run through Sunday, July 3. An Opening Reception will be held Friday, May 13, 5:30–7:30pm. In 1996 after graduating with his B.F.A from Creighton University, Matthew Dehaemers spent a year living and teaching high school art on the Navajo Reservation in St. Michael, Arizona. In 2001, Dehaemers earned his M.F.A. from the University of Wisconsin-Madison. Dehaemers applies the same process of community engagement and research when developing his many public art projects. Five of Dehaemers’ projects have received national recognition by the Public Art Network’s Year in Review as outstanding and innovative public art projects. He has completed numerous public art works in the local region including, “Seven Sentinels” for the Kansas City municipal art commission, “Detour” for the MoDot I-44 Welcome Center of Joplin among others. Nationally, Dehaemers has created works such as “Convergence” for the LA County Arts Commission and “Confluence of Time and Place” for downtown Casper, Wyoming. His more personally-driven gallery work has been recently featured at Charlotte Street Foundation La Esquina gallery, Museum of Nebraska Art and the Kaneko of Omaha, NE. Solo shows include “Watered Down” at the Lied Center, Creighton University, “402 Dis/Reconnect” for the Bemis Center of Contemporary art and “Retread” at The Studios Inc. in Kansas City, Missouri. This same idea of Matthew’s community-mindedness and collaboration inspired Project Reclamation, a public art project and art auction that honored the survivors of the Joplin tornado and supported Joplin artists who lost their homes and studios. Dehaemers documented home owners’ stories of survival and collected debris, which was then incorporated into over 100 new works of art by 98 Kansas City artists. All of the artworks were auctioned to raise funds for a grant program administered by Spiva, supporting Joplin artists affected by the storm. Dehaemers will deliver an Artist’s Talk on Saturday, May 14 at 10am in the Main Gallery at Spiva Center for the Arts. The artist will explain his creative processes, as well as the mechanics behind his works. Fusing – Grafting – Melding is sponsored by Hedman Chiropractic and Mense, Churchwell & Mense, PC – Chris Churchwell, CPA, with additional support from the Missouri Arts Council, a state agency. In the Regional Gallery, Dear World Revisited – you really need to see this! To memorialize the one year anniversary of the 2011 Joplin tornado, Robert X. Fogarty, accompanied by writer Adam Karlin and production manager Jonny Rosenbloom, visited Joplin to capture images and messages of residents, first responders, volunteers, and city officials affected by the storm. With handwritten text on their skin, the subjects addressed the viewer with statements of hope and defiance. The statements, ranging from “We can do it!” to “We forged love out of chaos” to “Tornado Badass,” imparted a relentless spirit that embodied Joplin’s recovery efforts. The resulting photos were exhibited in Spiva’s Main Gallery during Dear World, From Joplin with Love in July 2012, and a book of the same title was produced. Now, on the five year anniversary of the storm, Spiva Center for the Arts will revisit individuals from the original exhibit. How did they recover? What did their messages mean to the world? What can other communities learn from their experiences? The original photos and stories of selected storm survivors will hang in the Regional Gallery, along with updates on where they are now, how the tornado changed their life, and how our community recovered. This moving and inspirational exhibit will be an important component of the citywide Joplin Proud events commemorating the fifth anniversary of the tornado. Dear World Revisited is sponsored by Freeman Health System, with additional support from the Missouri Arts Council, a state agency. May is Preservation Month! 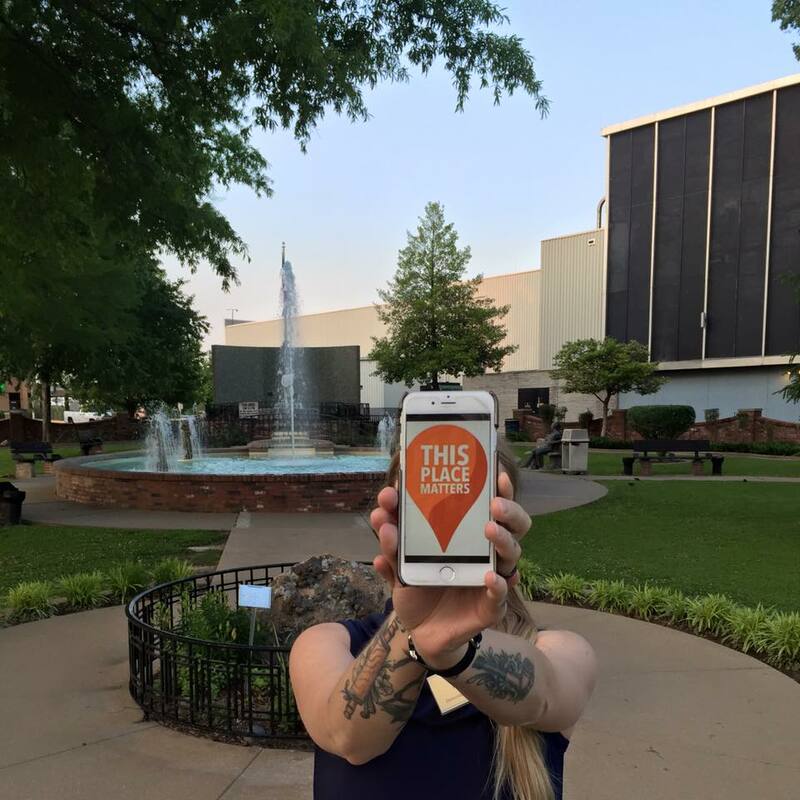 Which is why we’re excited to team up with Post Art Library and the Joplin Historic Preservation Commission to celebrate by encouraging participation in the National Trust for Historic Places’ This Place Matters campaign. Everyone has places that are important to them. Places they care about. Places that matter. This Place Matters is national campaign that encourages people to celebrate the places that are meaningful to them and to their communities. This campaign isn’t just about photography. It’s about telling the stories of the places we can’t live without. Through This Place Matters, the National Trust for Historic Places hopes to encourage and inspire an ongoing dialogue about the importance of place and preservation in all of our lives. 4) tune in to @SavingPlaces on Instagram and Twitter to see if the National Trust spotlights one of our photos! Be sure to share your photos with us on the Facebook event page, too. Come on, Joplin: This Place Matters!